uCurrent is small open source printed circuit board (PCB) that converts nanoamps (nA), microamps (uA), and milliamps (mA) to millivolts (mV). The board is designed to extend the low level current measurement capability of a digital multimeter (DMM) or and low ampere measurement to an oscilloscope for example. Use prior steps above to validate newly built board. Before using the uCurrent Gold current to voltage adapter in my optics bench I wanted to learn more about the circuit. One way to do this is through the use of LTspice simulation. 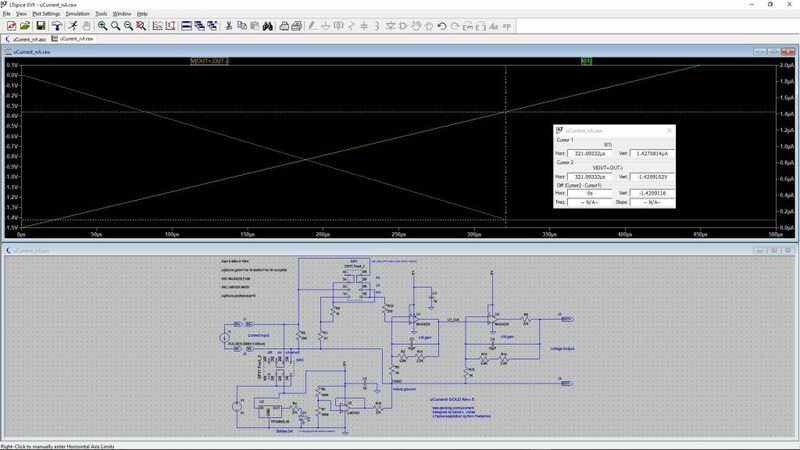 Two problems to overcome are 1) find or develop SPICE models for each component, and 2) keep simulation time short and without failing due some error within the models undetected in simpler test jigs (compared to a full circuit like uCurrent). I was able to overcome the problems in the use of LTspice thanks to several q/a sessions over at Yahoo’s LTspice group. Also I am pleased to say that the simulation of the uCurrent Gold behaves just as I was hoping so it is worth moving forward in a real test bench. Each of the IC’s and the switch used in the LTspice circuit for uCurrent had to be imported. The LMV321 and MAXIM 4239 op-amps had SPICE models available from their associated chip vendors. I created the TPS3809L30 voltage supervisor SPICE model using a hierarchical design starting from an LTC1440 battery indicator schematic. The double pole triple throw switch (DP3T) was also designed into LTspice from scratch. 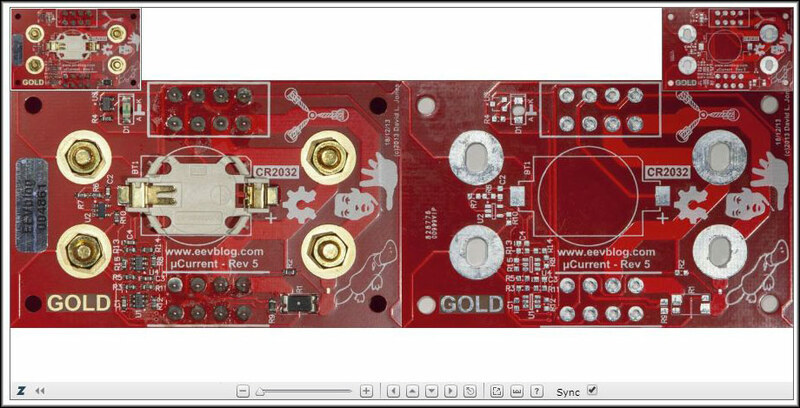 Compare a working board from EEVBlog with PCB from Seeed Studio. The zoomify tool is presented here showing top and bottom view of two different uCurrent boards: one finished board and one bare board. I have used this tool to verify that my bare board manufactured by Seeed Studio looks OK compared to the board used by EEVBlog. I will again use this tool when I am ready for parts placement while building my own board for the first time.